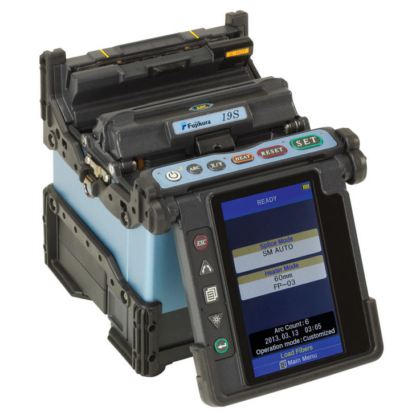 The Fujikura 19R Fusion Splicer Kit is a fully ruggedized, 4-fiber ribbon splicer, providing consistent, low loss, splice performance. The new design streamlines the steps required to complete splices, resulting in greater productivity. Configurable automation features allow you to customize the operation of the machine to best suit your particular splicing technique and process. A new programmable – automatic wind protector – closes and begins the splicing process after clamping the fibers in position or pressing the – set – button. Once the splice is completed the wind protector is u decide which, is automatically raised making removal of the fibers fast and easy! Similarly, the – clamshell – design of the tube heater clamps the splice splice protection sleeve and applies heat from both sides which results in a reduced shrink time of just 14 seconds. As a wholly owned subsidiary of Fujikura, AFL is the exclusive supplier of Fujikura fusion splicer products in North America. Fujikura is the world’s best-selling brand of fusion splicers, known for their ruggedness and reliability. AFL complements this with unmatched levels of service and support. Our team understands the high cost of equipment downtime and we are staffed to provide our customers with one to two-day turnaround times in most cases. We also offer 24×7 technical support. AFL offers an extensive lineup of fusion splicers for field splicing applications. From the world’s smallest fusion splicer to the world’s first fully ruggedized splicer, Fujikura has been the pioneer in fusion splicing technology since 1979. Current generation field models offer unmatched speed, ruggedness and reliability.